For this project, I finally did another Prismacolor drawing and I am so glad I did! While it took several hours each day for more than a week it was well worth it because I love how it turned out. 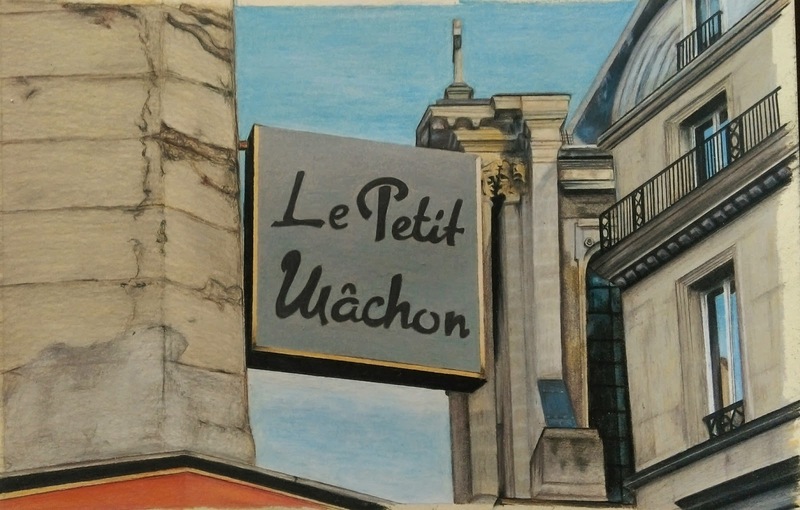 I started with a picture of this restaurant sign from Paris and did a light outline in graphite on a cream colored paper. I am glad I chose this color paper because it really allowed me to capture the colors in the buildings and in the wall, rather than trying to get the right color, I was able to just add to the background color and focus on the texture. I did the sign first and loved how sharp the black edges turned out. The building in the back was really hard and time consuming because of the weird shapes at the top of the columns and all the shadows. I was kind of worried about how the front building would turn out but I am so happy with how it looks, LOVE IT!! I have always loved reflections and I love these ones in the windows. I also love the pop of coral at the bottom because I think it really completes both the image and my drawing.